BIM/VDC is pulling us to new levels of collaboration, and project owners in BIM are facing an emerging challenge of how they set expectations and define project scopes. In this course, we’ll explore what happens when the general contractor opens the door for true design build and invites the mechanical contractor to coordinate directly with the mechanical engineer to provide LOD 400 for major elements of mechanical models. 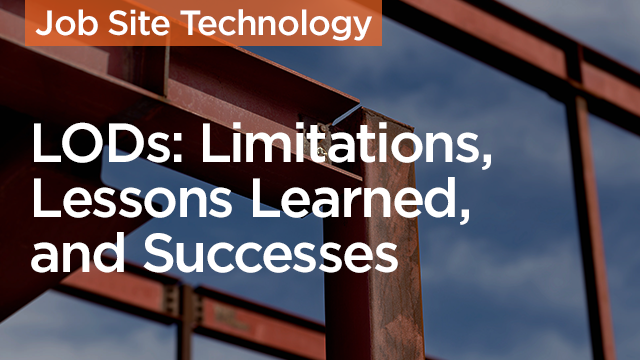 Learn from the successes of real project teams, move forward and be more efficient. This presentation shows how the model provides a reference for the latest 2016 Level of Development Specification, using a three-story medical office building. Input is incorporated from a fabricator and architect for guidance as the structural model is developed through four key stages. Define and describe the 2016 Level of Development Specification. Become more familiar with the distinctions between LOD 300, 350, and 400 models. Understand how your project’s teams can better coordinate and collaborate across all phases of a BIM project. Learn how to leverage a LOD 400 model during the design phase of your project.